Fishing reports have been very good this week. 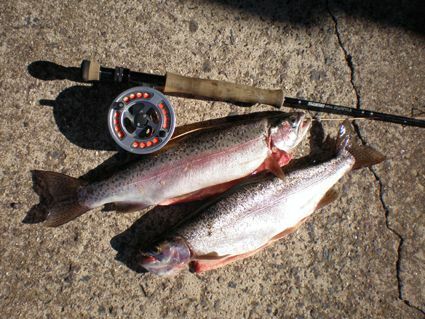 The quality of the Lake Eucumbene Rainbows is great and a few good ones in Jindabyne too. Eucumbene and Thredbo rivers primed to fire with some rain and are fishing well for resident fish and a few spawners thrown in too. We have had a report of a pet Dog eating a poison Fox bait or similar in the Old Adaminaby area of Lake Eucumbene on the weekend. Fortunately the owners were able to get assistance for the animal and it survived. Be aware that Fox baits may be laid in areas of farming land around the lake and as such if you have to bring your dog with you it is best to keep it on a lead to stop it from wandering. 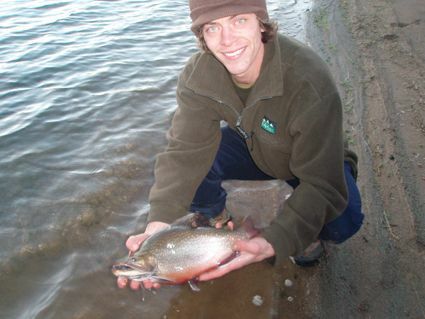 *From 1st May the bag and size limit in the Eucumbene River and Thredbo River changes to 1 fish only over 50cm. All fish under 50cm must be released and only one over 50cm may be kept. The whole of the Eucumbene River is open to fishing. Artificial lure and fly only in both rivers. Rivers:- Fishing methods are very dependent on the weather at the moment. A nice, still sunny day is ideal for searching with a dry and you may find a few fish rising if a hatch occurs. On overcast and cold days a nymph is a better option fished under an indicator. There are some spawing fish in the Eucumbene and Thredbo so Glo Bugs and Nymphs will start coming into their own as well. Any good rain over the next few weeks will see a bigger run of fish entering these rivers so keep you eyes on the weather forecasts. Dry fly fishing is still a possibilty during the day or evenings when a big high pressure system moves over the area and the condtions are fine and warmer. There have been a few hatches on the warmer days so don't pack the dries away quite yet. Pheasant tails, Hare & Copper, Gold Ribbed Hare's Ear, Black and Brown Nymphs are the pick of the flies with some having a beadhead an advantage if the river is up a little. Best Dry flies have been Klinkhamers, Adams, Wullfs and small black spinners. Lake Eucumbene:- Mudeyes are still showing up in the stomachs of some of the Rainbows so a Mudeye pattern, Craigs Nightime or a Mum's Poodle are well worth a go after dark. During the day searching with a Wooly Bugger or a Stick Caddis pattern might find a couple of fish. Look for areas with some depth as the really shallow areas seem to be holding less fish. *Two anglers fished the Frying Pan/Rushy Plains area on the weekend for twelve fish on Mudeye patterns to 1.5kg. Nearly all fish took them into the backing. That is great fishing indeed. *Michael Shanahan sent the report and photo below in of his first fish on fly and what a great Rainbow it is. Well done Michael. fish on fly. Thanks lads. Got these last Saturday day morning (5am) on lfly at Anglers Reach. Very fat, great fight and superb on the table. Both full of mudeyes. Pretty tough going, not a lot of action at all. Of all the bait fishers there, none had a touch all night, so was happy to pick these up..
Areas to try are Rushy Plains, Seven Gates, Collingwood Bay, Buckenderra and Yens Bay. 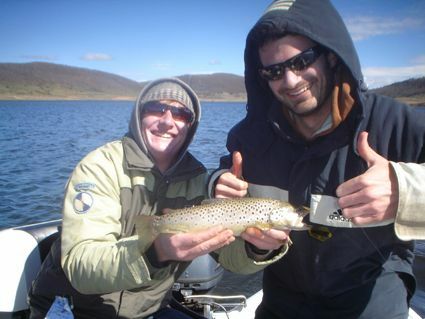 Lake Jindabyne:- Not a lot of change in reports from Jindabyne with few reports coming in. After dark with big wets is the best option but day time polaroiding is another method worth trying. You obviously need a bright still day for visibility and covering as much water as possible is essential. The river mouth is still well worth a look after dark and there are some good Browns staging in this area before they run to spawn. Sinking leaders and lines are the go and big size 6 and 4 Woolly Buggers, Fuzzy Wuzzys, Bushy's Horrors Craigs Nightimes etc are the best patterns to use. Best areas to look at in Jindabyne are Kalkite, Creel Bay, Waste point. Lake Tantangara :- A good number of fish cruising the edges early and late at present so well worth a look. 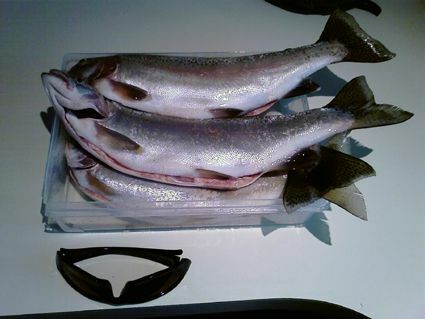 Eucumbene:- Reports from the lake have been fantastic. Despite the cooler temps leadcore and downrigging have been working very well of late. Flat line minnows and Tassies are still taking a few but the bigger numbers of fish have been caught deeper on the whole.Excellent Rainbows have been caught recently with fish over the 1kg mark being landed. With the bright conditions of late it is a must to be on the water at first light. Fishing a little deeper during the day is important also. Colour wise Tassies in yellow wing patterns have been excellent with Y82 and # 50 the continuing stand outs. Dual Depths Tassies in # 50 and #45 have been taking some BIG Rainbows. Number 72 Eliminator is a useful colour at the moment. Baby Vibe 43 minnows by River 2 Sea are another great little trolling lure worthy of a swim. The two Rainbow Trout patterns are the best colours. The Glass Shad Raps are another great fish catcher in the Rapala range with the Glass Gold Red and Glass Perch the best colours. RMG Scorpions have a new colour that looks great too the R31. Give it a try. Best areas have been around Seven Gates, Waiunui, Collingwood, Coppermine, Brookwood and Cemetary point area. 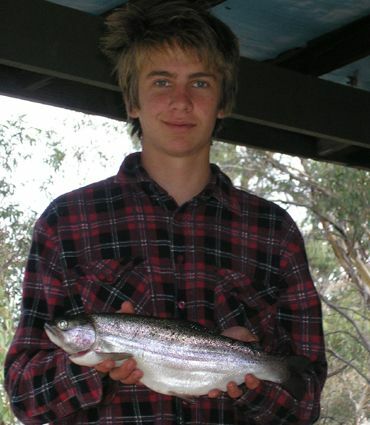 Jindabyne:- Trolling reports have been very quiet but we may just not be getting the reports. 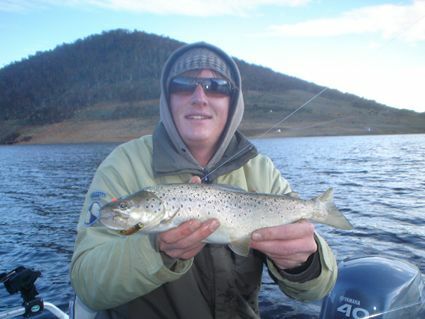 The fish should be on the go around the islands and the Snowy and Thredbo arms. A mixture of Lead core and Downrigging should produce along with flat line minnows. Stick to yellow wings and pinks in Tassie devils and some of the Gold holographic RMG Scorpions are a great lure to troll too. Spinning the Thredbo mouth from the boat is a great way to target staging Browns qth this time of year. Drifting and casting soft plastics and River to Sea Tungsten Vibes is a great way to connect with some good Browns. It is important to get the lure on or very near the bottom before starting a retrieve and keep it down for as much of the retrieve as possible. Using a sounder is a good way to find the actual river bed and also fish. This technique is very successful and with a little time and effort can be extremely rewarding. Give it a go. Took the 'brother-in-law to be' to Jindy on Sunday in an attempt to get him his first trout. He got very lucky indeed with a 65cm Buck Brown on a pink Tassie from the shore. Fish was in prime condition and very thick accross the shoulders, although nothing at all in his stomach and we know what that means. I on the fly rod got zilch. Tantangara:- Some nice fish to be caught trolling at Tantangara. 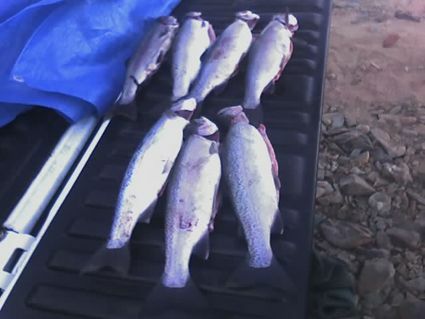 Dean Norbiato sent these pictures in of a couple of the fish they have caught trolling the dam recently. Good conditioned Browns indeed. Baitfishing :- Mudeyes are nearing the end of regular supply but will still take fish over the next month if available. As the weather continues to Powerbait and Scrubworms will take over. Baitfishing reports have improved again. It is important to find bays with some weed or lots of weed for best results. My name is Shaun. My mate Neil and I came up from Canberra last Friday night and we fished out at Seven Gates near White Rocks. We got a great haul of 7 Rainbows throughout the night. I had two on my lines when I woke up at about 5:30am. We had better luck using sherbert power bait. It was a clear night with no moon so it was really dark. It was great fun so we will be coming up more often if our wives lets us. Headed up to Wallace Island via Seven Gate Rd and fished on the side facing Old Adaminby on Friday night. We started fishing around 20:00 and hooked up 11 nice pieces until 04:30 the following morning. A picture of four of the fish (just about to be thrown in the pan) is attached to this email. Note that all of the sizes were fairly consistent (around the 1kg mark) and pretty fat - there seemed to be a fair bit of insects still flying around the lake. We used 1cm piece of bardi grub and the rainbow coloured powerbait on a size 8 hook. In Jindabyne try Waste Point, Kalkite, Hatchery and Hayshed bays.